Adding multimedia to your LilnkedIn profile is a great way to showcase your work and provide your audience with proof of your abilities. Certainly when you are in a creative field, adding work samples is pretty easy. It’s your best portfolio pieces that you upload to your Summary and individual Experiences. But what if you aren’t in a creative field? Think in terms of your goals and target audience. If you are on LinkedIn to be seen as a thought leader and expert, upload that podcast interview or link to that video interview on YouTube. Scan that newspaper article in which you were quoted. Looking to be seen as a leader? Upload a picture of you and your department at a team building event. Using LinkedIn for prospecting and sales? 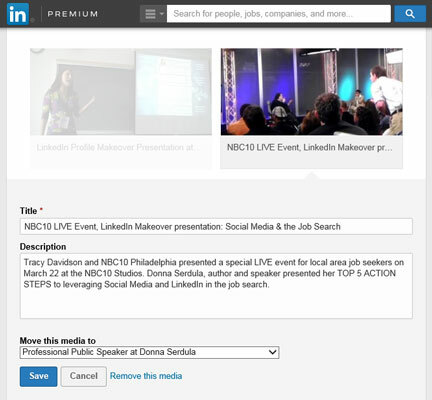 Upload that presentation slideshow or video demo you created. On LinkedIn for job search? Showcase your work by uploading a white paper or a dashboard report (minus any confidential or proprietary information) showing your past successes. Make sure that what you choose makes sense to your reader. 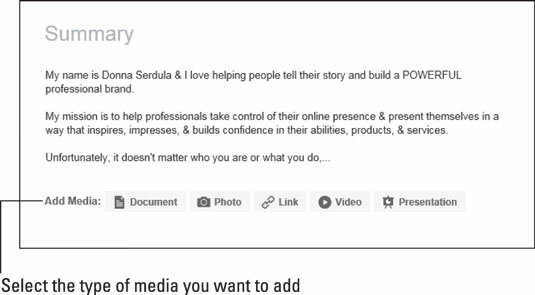 It’s best to include a title and descriptions for each multimedia file or link you attach to your profile. Open your profile on LinkedIn. Scroll to either your Summary, Experience, or Education section where you want the multimedia work sample to reside. Hover your mouse pointer over the section and click the Add Media button that corresponds with the type of media you want to add, as shown here. If you don’t see an Add Media bar, look for an icon in the shape of a little square with a plus sign to the right of the section heading. To add a link to external media, paste the URL into the blank URL field and click the Continue button. If you would prefer to upload media that resides on your hard drive, click the Upload button. An open dialog box appears. Locate the file on your hard drive and click the Open button. Enter a title and description, as shown. Adding a description to a work sample media file.